Today, Gov. Jay Inslee signed what looked like a balanced budget, but left with a $2 billion question mark. Blame the class-size initiative, narrowly passed by voters last year. Initiative 1351, which did not specify any source of funding, was basically ignored in the budget-writing process by the Senate, the House and the governor. Instead, the Legislature set out to delay the implementation of the initiative by four years. The liberal House, controlled by Democrats, easily gathered the 2/3rds votes necessary to delay the law. When I spoke with Sen. Michael Baumgartner yesterday, he expected the Senate, controlled by Republicans, to easily follow suit. But Rich Wood, spokesman for Washington Education Association, cautioned leaping to such conclusions. He knew what he was talking about. Come this morning, the celebration about the initial budget had turned to anger. On Twitter, state Sen. Michael Baumgartner, who had been celebrating the victory for students in the operating budget, was calling Sen. Andy Billig and several other Democrats liars. Billig had refused to vote for the bill to be delayed. "Reckless, irresponsible Senate Ds break budget deal, decide to play [Russian roulette] with poor to try to again force tax increase," Baumgartner wrote on Twitter. "Budget now $2B out of balance and illegal. Chaos." He told KIRO radio the same thing. "Half the Senate Democrats kept their word, the other half decided to play politics," Baumgartner said. "There was a huge fight among the Senate Democrats on the floor...and the whole thing broke up." In the late afternoon, I caught up with Billig to ask him what happened. Did he have an agreement, then go back on his word? "Absolutely not. Absolutely not," Billig says. "That’s a complete fabrication." If there were agreements of any kind, Billig says he wasn't told about them. In fact, what had surprised Billig was how little anyone had been talking about the $2 billion elephant in the room. On Saturday, he had a bipartisan late-night negotiating session with the state's political leadership to run down the checklist of what needed to be done before the end of the session. "We had a list of all the bills that needed to be done. All the big pieces," Billig says. "It wasn’t mentioned in that meeting." He says he assumed that they hadn't mentioned it because they had decided to ignore the initiative, for now. "Everybody knew we weren't going to have any money for I-1351," Billig says. "There were a few ideas going around. We could repeal it, suspend it, and ignore it." The initiative, he says, doesn't have to be funded until the end of the biennium, giving the legislature more runway to figure out what to do about it. Olympia, in fact, has more time to deal with the initiative than many have been pretending, Billig says. "It feels to me like the Senate Republicans manufactured [the appearance of] a crisis in order to bury this initiative for four years," Billig says. "We can solve I-1351 right now, next month, or in a couple of months. 1351 was an unfunded initiative last week, and it is an unfunded initiative next week." He certainly wasn't expecting to have to take an early morning vote on it. "I knew it wasn’t going to be funded," Billig says. "I did not know, and nobody knew, and nobody on caucus knew, that we were going to ask to take an affirmative vote [to suspend it] without any discussion how best do it." And for many Senate Democrats, suspending the initiative was a heavy lift. In many of their districts, the initiative hadn't just passed, it had passed overwhelmingly. "Just casually expecting a legislator to vote to suspend the will of the people without any discussion?" Billig says. "Over a day ago, we told [the Republicans] we don’t think the votes are there." Billig says that Senate Democrats told Senate Republicans they might be able to get more votes in support of suspending the initiative in exchange for a bill getting rid of the biology test requirement. Republicans, he says, weren't receptive to that idea. Early in the morning, Billig says, Senate Republicans temporarily held the transportation and capital budgets, threatening to refuse to release the budgets until Democrats voted to freeze the initiative. Some Democrats, like Billig, still wouldn't vote for it. It's not that he's necessarily opposed to ever suspending the initiative. He just wants it to do be done the proper way. 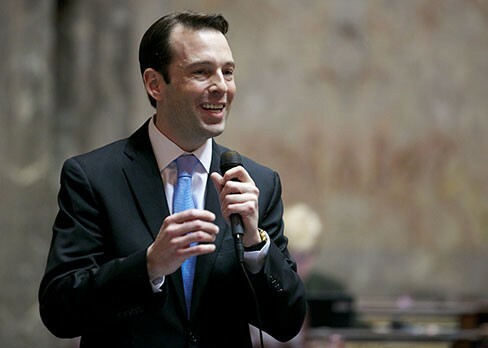 "If we are going to suspend the will of the voters on an initiative that is targeted helping students in Washington, we need to do that in a thoughtful, productive way," Billig says. "Not rammed down somebody's throat at one in the morning,"
WOULD YOU RATHER: A) lower K-12 class sizes, or B) eliminate WA public college tuition? A budget-busting initiative aims to reduce class sizes — but is it worth it?